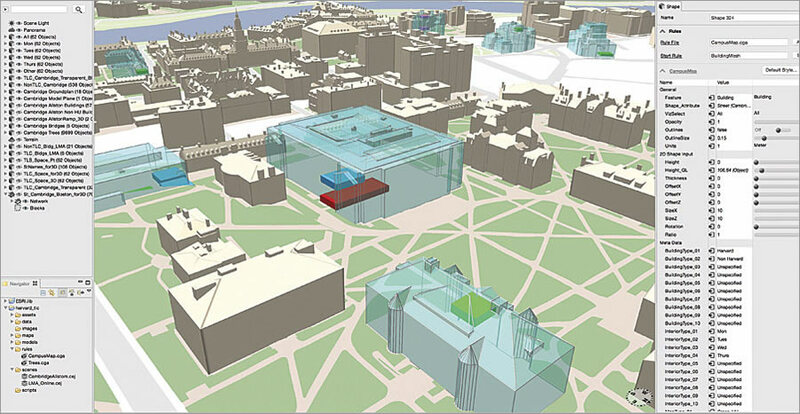 Harvard University's 3D campus maps are shared online using CloudCities, an online 3D web sharing service from SmarterBetterCities built on top of ArcGIS technology. Harvard University has several campuses in Cambridge, Massachusetts, and the neighboring city of Boston, plus footprints around the state and in multiple international locations. In total, Harvard manages 660 buildings that give its 21,000 students and more than 16,000 faculty and staff access to the university's renowned working environments. To provide useful visualizations of the campuses, Harvard Planning and Project Management (HPPM) has used 3D for more than 18 years in conjunction with 2D maps. Initially, HPPM modeled buildings individually in great detail, relying on existing 2D computer-aided design (CAD) where it was already available. This was tedious and expensive work. Despite their complexity, these models were used for scenario visualization and decision making but weren't adequate for conducting 3D spatial analysis, which is critical for exploring interdependencies between built structures to conduct energy planning or perform impact analyses of potential new buildings and remodeling projects. Harvard also wanted to make all this generally accessible online. As Harvard's campuses continue to develop, creating a GIS-generated 3D map was crucial. While 2D campus maps are typically limited to representing land-use zones, building locations, facilities, and transportation networks, 3D maps connect individual buildings with geographic context. Suddenly, a building or even an individual room can become more than a singular component of a campus inventory. A constantly updated and evolving 3D campus map can be used for integrated and interdisciplinary planning and management. The metadata in a 3D map allows databases to be viewed in diverse ways: Planners or managers can see recent campus projects and assets, staff and students can easily find campus locations, and the vice president for finance can produce fiscal reports. Fortunately, over the last three years, many of the technical challenges of making 3D maps have ebbed significantly as GIS software and computer hardware have evolved. 3D content is no longer limited to desktop computers, as smartphones and tablets can display beautiful 3D maps just about anywhere. And converting 3D CAD data into geodatabases has become much less time-consuming. These technological strides make 3D cartography an indispensable tool for carrying out important tasks. Given the number of campus buildings at Harvard, HPPM needed to create an integrated workflow. After 3D models from CAD or photogrammetry are prepared, the data is imported and formatted using Esri CityEngine. To reduce the time it took to convert 3D CAD data into geodatabases, the department implemented Esri Silver Tier partner Safe Software's FME data integration solution to convert non-GIS files into the Harvard University 3D GIS database. But the file sizes for detailed converted 3D CAD models can get very large, which renders it impossible to work with on a campus-wide scale and also makes it infeasible to stream 3D data, meaning that conducting even simple 3D spatial analysis would fail. So Harvard looked for alternatives. HPPM conducts flyovers of Harvard's campuses every other year to produce high-resolution stereo aerial photography to make it easier to track changes on campus. This type of input data is ideal for building lightweight 3D models, so Harvard worked with Esri Silver Tier partner CyberCity 3D to use this imagery to create the 3D models of Harvard buildings. These new 3D models replaced the detailed models. HPPM then incorporated the 3D buildings into a high-resolution terrain model so that planners and architects could make good use of the map. To colorize and unify the 3D data, HPPM used Esri CityEngine, which efficiently brings together different data sources and makes it easy to fine-tune the 3D model data. Some individual building models had to be split according to ownership, building name, and street address to discern which sections of a building are part of Harvard and which aren't, since Harvard shares real estate with Cambridge and Boston. The buildings needed to be aligned with the terrain data as well, which can be time-consuming. Harvard worked with Esri emerging partner SmarterBetterCities to optimize the 3D campus model by giving it a Harvard look and making it even more lightweight. SmarterBetterCities used CityEngine rule packages to provide custom map symbologies, which makes it easy for Harvard to maintain and edit elements of the campus model. The campus models were exported as a geodatabase. Using ArcScene and ArcGIS Pro, HPPM can easily process 3D data; perform common operations, such as unifying projections; and implement additional attributes from other resources, including Microsoft Excel tables. At last, Harvard had a lightweight, campus-scale 3D model that could be used for 3D spatial analysis as well as new-use case studies, such as climate change investigations, plotting new development scenarios, designing novel campus lighting projects, visualizing bike routes, and coming up with detailed vegetation plans. Completion of Harvard's 3D campus model gave rise to the next logical step: sharing 3D models with the public via the Internet. Stepping into the online world required a reliable 3D hosting service to ensure a great user experience, so Harvard used SmarterBetterCities' CloudCities, an online 3D web sharing service for cities that is built on top of ArcGIS technology, including CityEngine. It allows users to easily upload 3D models and embed them into a website. Additionally, ArcGIS Online users can directly access their content on CloudCities and share data on smartphones, tablets, and computers without installing software. 3D models could become important prototypes for novel workflows that bridge the gap between GIS and computer-aided architectural design (CAAD). They could help launch applications, such as indoor navigation or that manage smart metering devices. As an early demonstration of this, Harvard and SmarterBetterCities created a room-finding web application for the 3D campus map. More than 60 learning and teaching spaces were plotted on the campus map and made available to the Harvard community as a 3D web application during Harvard's Learning Spaces Week in early June 2015. Even though most event participants were not familiar with GIS, many of them found the application easy to use and valuable. For the next phase of the 3D campus map, Harvard is working with Esri and SmarterBetterCities to develop a more advanced interior model that includes rooms, stairways, elevators, and building systems. For more information about 3D campus planning, email Parvaneh Kossari. To learn more about Esri-based 3D web GIS solutions, email Jan Halatsch.